LAZARE-AUGUSTE MAQUAIRE (1872-1906): Première Symphonie in E Flat, Op. 20, JULES GRISON (1842-1896): Toccata in F, LEON BOËLLMANN (1862-1897): Ronde française, Op. 37, LOUIS JAMES ALFRED LEFÉBURE-WÉLY (1817-1880): Boléro de concert, Op. 166, CAMILLE SAINT-SAËNS (1835-1921): O salutaris hostia from Mass, Op. 4, JEHAN ALAIN (1911-1940): Litanies, JEAN FRANÇAIX (1912-1997): Suite Carmélite, KARL JENKINS (b.1944): Celebratio, DAVID GERMAN (b.1954): Festive Trumpet Tune, STEFANO BERTULETTI (b.1962): Fuga sopra un Soggetto, GEORGE FRIDERIC HANDEL (1685-1759): Overture to The Occasional Oratorio (arr. Coleman/Setchell). Description: This is here for the 1905 symphony by Maquaire (his First and also his last), a fine four-movement French Romantic work in the style of his teacher Widor; there is no other recording available. Also, one doesn't associate Françaix with organ music (although there was a 1995 CD devoted to it), so his 1960 six-movement suite of Carmelite nun character studies (i.e. movements named after nuns who may or may not have existed) may fill a repertoire hole for collectors. 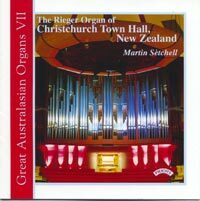 Martin Setchell (Rieger organ of Christchurch Town Hall, New Zealand).